Economist's View: The "Embarrassment of Riches"
9-9-9: The Most Massively Regressive Redistribution of Taxes Ever Seriously Considered, by Jared Bernstein: The Tax Policy Center’s analysis of candidate Herman Cain’s 9-9-9 plan is out and man, it provides us with an embarrassment of riches in terms of which data to feature. 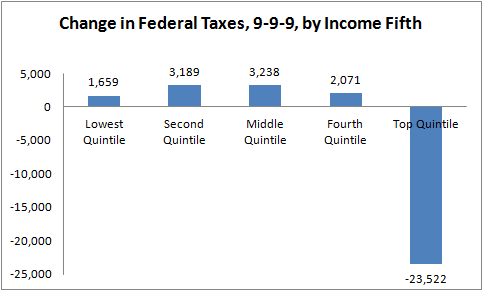 So let’s stick with the “embarrassment of riches” theme and look at dollars of federal tax change by income class. The first figure shows that average tax payments go up, on average, for the bottom 80% of households, including the bottom fifth (average income, $10,100) by about $1,700, and for the middle fifth (avg inc: about $50,700) by about $3,200. The average tax payment for the top fifth (avg inc: $273,000) falls by about $23,500. Source: TPC, see link above. But aggregating things up that way obscures just how extremely regressive 9-9-9 really is. If you break out the top 1% (avg inc: $1.8 million) and the tippy-top 0.1% (avg inc: $7.9 million), that’s where you really see the plan go to work. 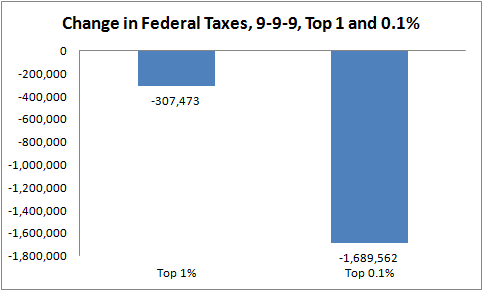 It reduces the tax burden of the top 1% by $300,000 and that of the top 0.1% by…get ready for it…$1.7 freakin’ million. Souce: TPC, see link above.